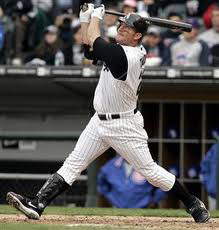 Will Nice Guy Jim Thome Slam His Way Past "Slammin" Sammy Sosa? Jim Thome has a reputation. And, unlike so many sluggers in the big leagues, his reputation is a good one. He is known for being a relatively calm influence in the clubhouse and known for his dedication to the game and his teammates. Most teams that have had him on their roster offer only glowing reviews of his performance on and off the field. That does not mean the man isn't a powerhouse. 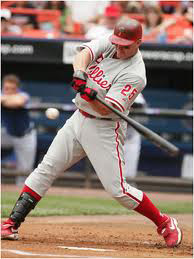 The fact remains that Jim Thome is likely to go down in baseball history as one of the best sluggers the game has ever known. He has played for a number of teams during his career and, in each case, he has left an impression that has caused fans and management to admire him. Thome is originally from Peoria, Illinois, and he made his mark and his name in the big leagues by slugging out the homers for the Cleveland Indians between 1991-2002. He then moved over to the Phillies from 2003-2005. He was with the White Sox from 2006-2009, then the L.A. Dodgers, back to the Indians and, now, back to the Phillies. During that career he has amassed 605 home runs, 2,295 hits, 1,677 RBI and 2,500 strikeouts. The thing is that Thome is 41-years-old. That is a time when most baseball players are looking to retire. But baseball just seems to be so ingrained in Thome's character that retirement seems out of the question. It was questionable where he would end up, or if he would play, in 2012, and then in November of 2011 he signed a one year $1.25 million deal to play with the Phillies. Since the Phillies already had a first baseman, and Thome had been playing as DH for the Indians prior to this, it seemed like Thome would be used sparingly. Then, the unthinkable happened. Ryan Howard, the Phillies' first baseman, got himself injured. Suddenly, Thome was back at the plate and playing first base. Now the question is, will his time playing, while Howard recovers from his injury, give him the chance to pass Sammy Sosa on the all-time home run list? Sosa's record currently stands at 609 home runs for his entire career. Thome currently has 605. You can see that this means the slugger need only hit five home runs to surpass the former Chicago Cubs outfielder. Of course, there also remains the fact that Thome's career is free of the controversy that has visited Sosa's, as Sosa has often been accused of using performance-enhancing drugs to accomplish his impressive record numbers. As for Thome, he continues to do what he always does. He continues to try and be a calming force in the Phillies' clubhouse. When asked about this opportunity, he says he is only there to fill in for Ryan Howard, while Howard recovers from his injuries. In fact, for the most part, the Phillies are a young team, filled with hope, and Thome says he respects that. He has told the press he is only there to help the team win. That may be the case. However, there must be some part of him, at the back of his mind, who knows that he could use this opportunity to further cement his legacy and mark him as one of the greatest sluggers that the game of baseball has ever known. With an injury, he may really get that opportunity, and the record currently held by Sosa could go down something during 2012.